In June 1873, Colonel Sherman Stevens built a sawmill and flume on Cottonwood Creek high in the Sierras directly west of this spot. The flume connected with the Los Angeles Bullion Road. The lumber from the flume was used for timbering in the mine and buildings, and the wood was turned into charcoal in these kilns, then hauled to Stevens Wharf east of here on Owens Lake. There it was put on the steamer the "Bessie Brady," or the "Mollie Stevens," hauled directly across the lake, and from there wagons took it up the "Yellow Grade" to Cerro Gordo Mine, high in the Inyo Mountains above Keeler. M. W. Belshaw's furnace had used all the available wood around Cerro Gordo and the charcoal was necessary to continued production. The bullion which was then taken out by the reverse of this route was hauled to Los Angeles on Remi Nadeau's 14, 16, 18 animal freight wagons and played a major part in the building of that little pueblo into the city of today. Plaque originally dedicated in 1955 by the California Eastern Sierra Museum Association. Plaque stolen in 1970. Recovered by Inyo County Sheriff's Dept. Rededicated May 15, 1976. 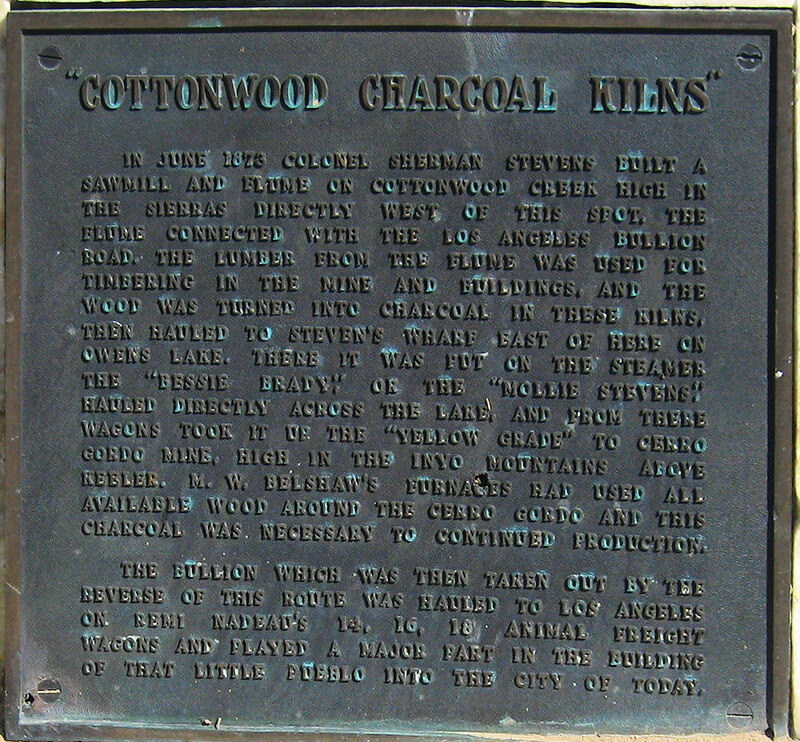 U. S. Highway 395: near Cottonwood Charcoal Kilns. Other photos about Geography - Northern Mojave or Cottonwood Charcoal Kilns.